Reverse osmosis, often abbreviated to RO is a membrane filtration process that is used extensively for the desalination and purification of water. Accepta’s range of high-performance reverse osmosis chemicals are based on advanced formulations and include RO membrane cleaners and detergents, scale inhibitors and antiscalants, corrosion inhibitors, biocides, antifoulants, de-chlorinators, and flocculants. 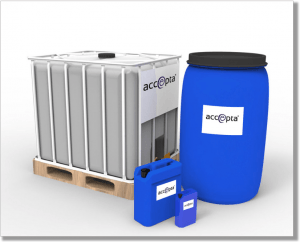 Accepta’s advanced RO chemical formulations have been developed specifically for the international membrane filtration and reverse osmosis markets and offer several key performance benefits including cost, convenience, operational performance and environmental impact. Accepta’s advanced reverse osmosis chemicals are scientifically formulated to help optimise reverse osmosis recovery rates, improve the operational efficiency of RO plant installations; and reduce problems associated with scaling and corrosion.